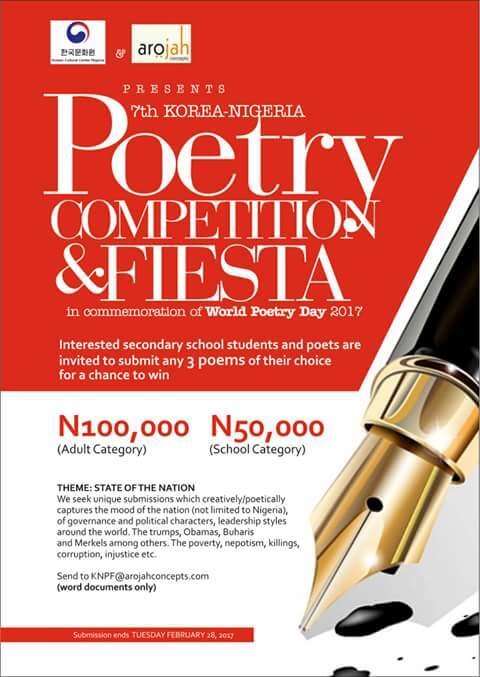 Arojah Concepts in collaboration with the Korean Cultural Centre in Nigeria (KCCN), will again join the rest of the world in commemorating the World Poetry Day with the annual Korea-Nigeria Poetry Competition & Feast. This year’s edition, which is the 7th in the series, will focus on the STATE OF THE NATION. • All entries should be in a single file of a word document, sent either as an attachment or in the body of the mail. No PDF file would be accepted. • A shortlist of 10 poems/poets selected by a three-man panel will be announced on MARCH 10, 2017. 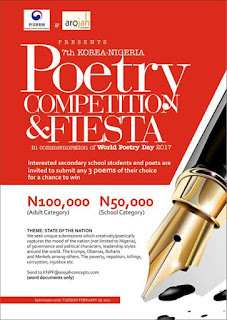 • All selected poems/poets will receive certificate of merit/participation during the 7th Korea-Nigeria Poetry Feast in Abuja on TUESDAY MARCH 21, 2017 while the selected poems will be performed by Arojah Royal Theatre as part of activities marking the World Poetry Day. This will include the presentation of the second edition of the Korea-Nigeria Poetry Anthology.